Being able to manage files on iPhone without using iTunes is always a great idea for iOS device users. While iTunes does work, it does have numerous limitations. For example, it only supports purchased files. Also, when transferring data between your computer and your iPhone using iTunes, you will end up overwriting the data you currently have on your iOS device. For these reasons, most iOS device users will look for better alternatives. One of these alternatives is TunesGo. Although this iPhone manager has been around for a while, you may have not come across it yet. In this article, we will be focusing on answering the question, “how much does TunesGo cost?” However, before we answer this question, let’s determine what TunesGo actually does. TunesGo supports the transfer of all media files. It allows its users to transfer Music, Videos, iTunes U, Audiobooks, TV Shows, and more. A user can transfer these files from iTunes to an iOS device and vice versa. The tool assists with transferring photos to the computer from the iOS device and vice versa. users can use the tool to create gifs from their live and static pictures. TunesGo lets its users Add photos to a specific album, preview the pictures, and even delete these pictures. TunesGo will help with back up creation for both SMS and Contacts on the computer. The tool will also allow its users to import contacts from the computer or outlook to the iPhone in case the user needs to restore the contacts. Annual Subscription – This will involve paying $39.95 every year to continue enjoying the full TunesGo features. This Annual Subscription license is for a single PC. Lifetime License – This will involve paying $49.95 in order to enjoy using all the features available on TunesGo for as long as you want. This license is also for a single PC. Family License – This allows the buyer to use TunesGo on 2 to 5 PCs. After paying $134.95 the customer can use TunesGo without having to pay any recurring fees in the future. While TunesGo does have some great features, its prices are out of the affordable range for most people. This raises the question, is there a better and affordable tool that can help with iOS device management? Two-way transfer of all media files between iPhone and computer, between iPhone and iTunes. Sync iTunes library to iPhone without losing any previous data. 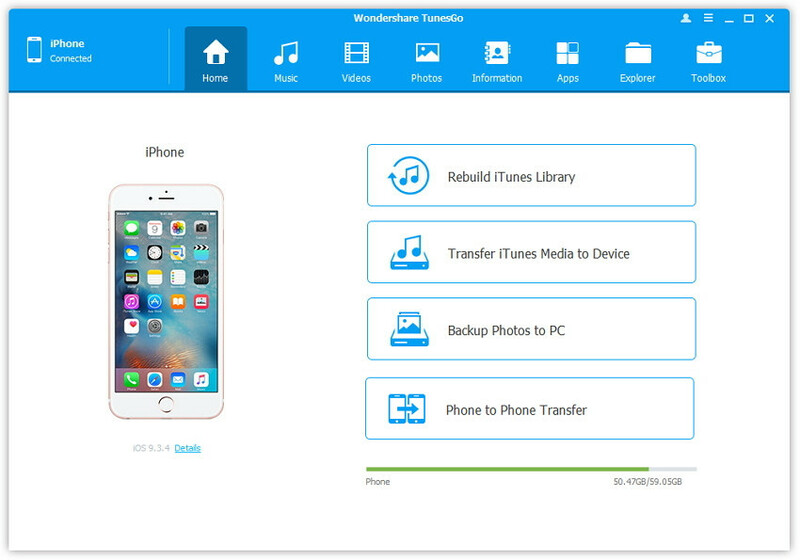 Back up iPhone data and restore the backup anytime you need it. Support numerous media files, including videos, music, playlists, photos, ringtones, audiobooks, podcasts, and 10+ more. Basic Plan – This will cost $29.95. The license can be used for a single PC and it is valid for one year. Family Plan – This can be used on up to 5 PCs for a lifetime. It will cost you $49.95. Multi-user Plan – This plan has several licenses and all of them are lifetime. Their prices start from $69.95 to $259.95, depending on how many PCs are supported. It has a higher cost efficiency when compared to TunesGo. It is both cheaper and has more features. The tool has a 30-day money back guarantee. If you do not like the tool, you can request for a refund. It makes rebuilding the iTunes Library possible with just a single click. Users get free lifetime updates. The team behind TunesMate is all about helping their customers save money. This is why the readers here are offered an extra 20% discount when they purchase this awesome iOS device management tool. To save 20%, customers only need to use the coupon code below at checkout. Step 1: Copy the coupon code and then go to the TunesMate purchase page. Choose Windows or Mac depending on the computer you own. Step 2: Choose the plan you prefer and then tap Add to Cart. Step 3: Locate and then check the “Check to enter coupon code” checkbox. Step 4: Paste the coupon code you copied in step 1 into the text box that appears and tap Apply. Step 5: Your price will be immediately reduced by 20%. Now you can proceed with the checkout process.